nice b&w shot.love the contrast and pov.fav for me! Bad weather sure gives us great photo ops. Nice. The strong contrast between the dark, sharp lamp and the delicate, soft, lighter background makes this an eye-catching photo. Fav again. Awesomely done! Fabulous eye for this composition. So beautiful! That misty mood is fantastic! This is so beautifully composed. You have such a good eye for these things and your shots always help inspire me. Fav. love the composition and the background view! amazing capture! superbly seen and composed Lisa ... love those strong lines with the soft background and your b/w processing higlights the contrasts so well ... a fav no doubt!! Love the composition. Great capture! I'm catching up, I hope -- I missed this earlier and really like the composition. Fav. 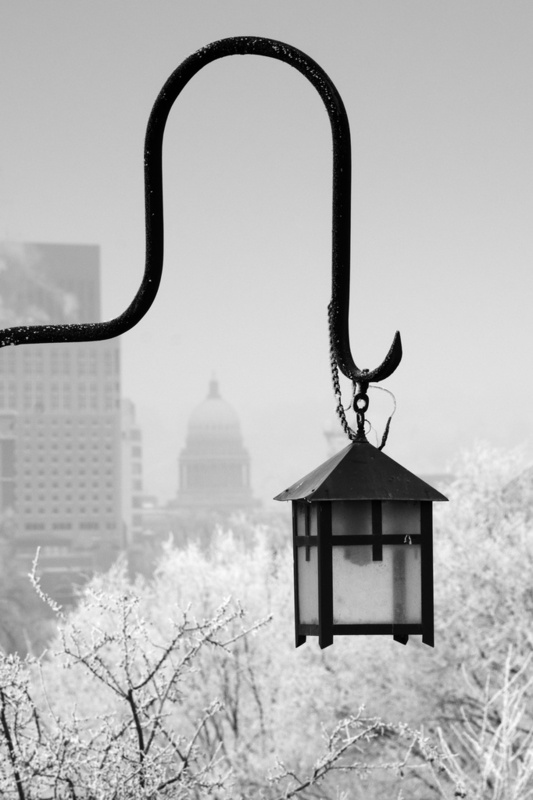 Great photo - love the composition of the lamp with the city on the background. Really think that being in B & W makes this photo.